PostEurop is proud to announce Swiss Post and Österreichische Post as joint winners of the 2018 edition of the Innovation Award. 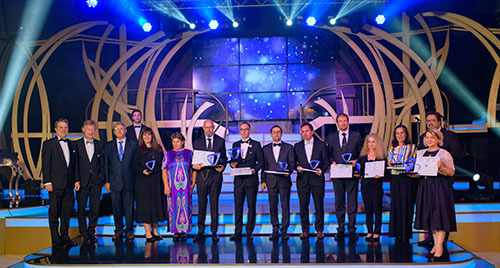 The award ceremony took place during the 25th Anniversary gala dinner in Tbilisi, Georgia. The Innovation Award was created last year by the PostEurop Operational Activities Circle (OAC). It aims to foster a stronger affinity and engagement in innovation concepts, ideas and findings among our Members in a consistent and continuous manner. Through the Award, PostEurop would like to recognise Members’ accomplishments in this area. The organising team received 11 persuasive Innovation entries from members Österreichische Post, Czech Post, Omniva, Groupe La Poste, Deutsche Post, Kazpost, Makedonska Post, CTT Portugal Post, Russian Post, Swiss Post and Turkish Post. After carefully studying each submission, the panel of jurors deliberated and announced a tie for the 2018 Innovation Award. The winners are Swiss Post for their Smart Pharma project, and Österreichische Post's for their "PHS Logistics technics (PHS)" project. Swiss Post's Smart Pharma, is a cost-efficient logistics solution for temperature-controlled transport in the pharmaceutical Industry. It Involves using temperature forecasts to determine the right packaging in accordance with temperature specifications and good distribution practice at a minimum cost. Österreichische Post's (Austrian Post) teamed-up with start-up "PHS Logistics technics (PHS)" and built a rapid unloading system that will revolutionize the entire parcel. The system is completely automated and increases the unloading throughout by 100%, while employees can work more ergonomically. Using an Intelligent algorithm, it is also able to unscramble parcels with low space requirements, which Is why It can be retrofitted at any location. Both winners were awarded with the uniquely designed 3D trophies specially made for the PostEurop Innovations Award. This year’s jury* comprised of the following Individuals were tasked to analyse all of the submitted entries and cast their votes for the winning project. "We are extremely proud for having again received a large number of applications, reflecting an amazing innovation culture amongst the PostEurop Members. Our Award acknowledges and further supports this culture. Facing major challenges, the postal industry needs a steady stream of product and process innovations in order to provide services which markets and customers rightly expect" emphasized Jürgen Lohmeyer, Chair of the PostEurop OAC.